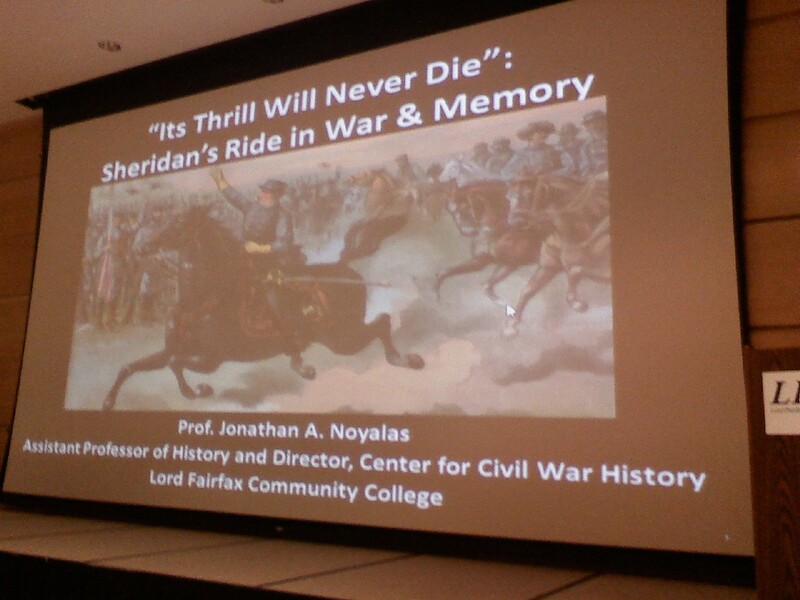 This was Jonathan Noyalas’ presentation in the 1864 Shenandoah Campaign and the Burning Sesquicentennial Conference held at Lord Fairfax Community College in Middletown, Virginia on August 2, 2014. On the night of October 19, 1864, Major General Philip H. Sheridan and his friends, George Crook, were sitting around the Belle Grove Mansion that night reflecting on the day’s events at the Battle of Cedar Creek. 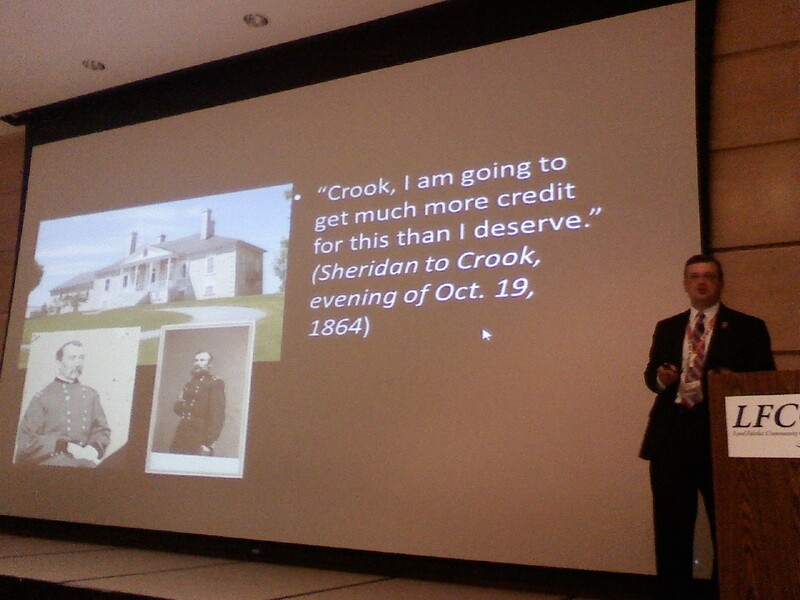 Toward the end of the conversation, Sheridan turned to his long-time friend, George Crook, and said, “Crook, I am going to get much more credit for this than I deserve.” Sheridan could have never imagined how his victory at Cedar Creek would come to define his legacy in the popular consciousness. 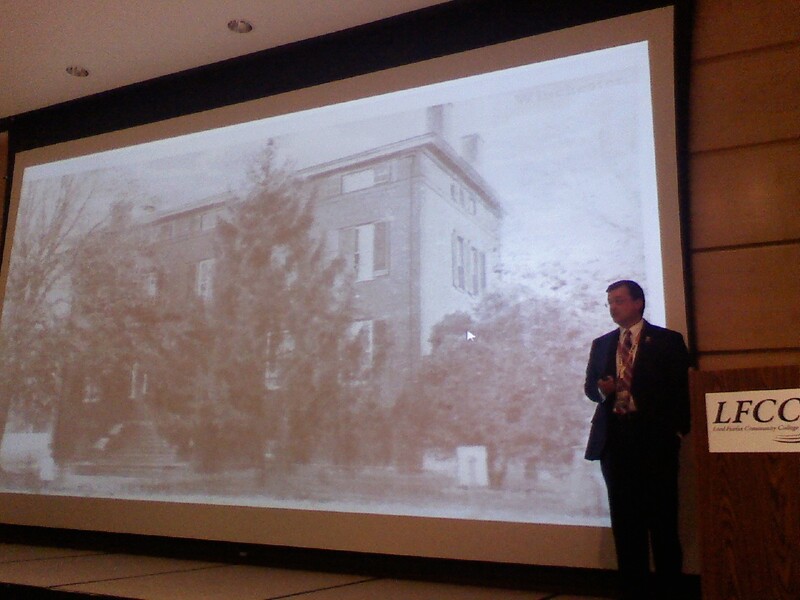 Jonathan told us that Phil Sheridan spent the night of 18 October 1864 at the Logan House on Braddock and Piccadilly Street in Winchester after a 3-day visit to Washington, DC, where he had been meeting with Secretary of War Edwin M. Stanton and President Abraham Lincoln, talking about the next step for military operations in the Shenandoah Valley. 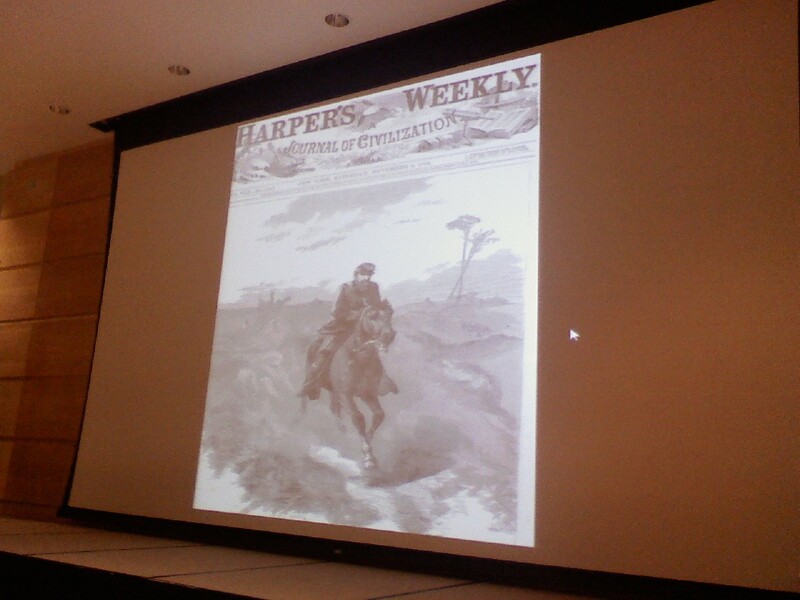 Union war planners felt that Early was done for in the Valley. 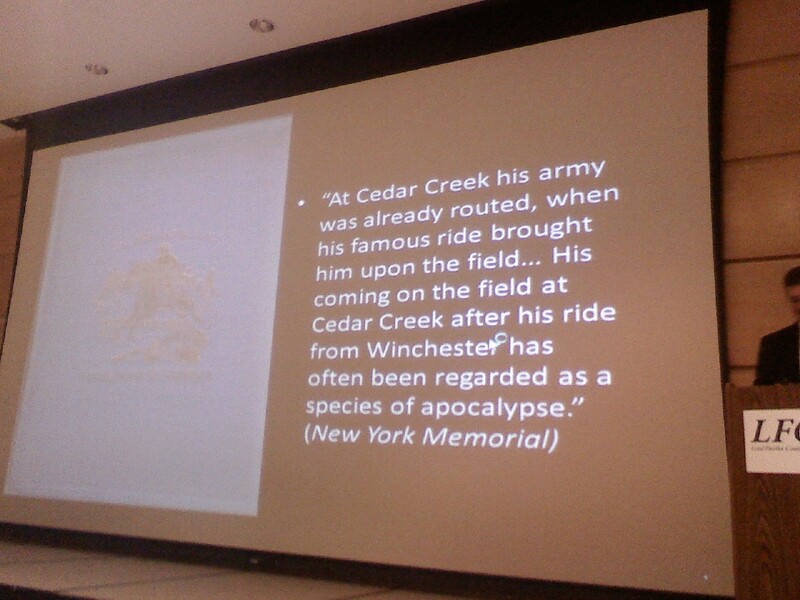 When he arrived in Winchester that evening, Sheridan sent a note to the temporary army commander, Major General Horatio G. Wright, and asked him if he wanted Sheridan to come to Cedar Creek, did he have everything under control? Wright basically responded, don’t worry boss I have everything taken care of. Obviously, he didn’t, because he got surprised the next morning. When Sheridan woke up on the morning of October 19, he had no idea of the disaster befalling his army along the banks of Cedar Creek. He sat down at the breakfast table and started to receive reports from Union pickets on the outskirts of Winchester that there was artillery fire in the distance. Sheridan at first didn’t think anything of this because he knew there was a reconnaissance in force under Colonel Edward Molineux supposed to go out that morning. But as he ate his breakfast and thought about those reports, he thought it best that he should ride south to Cedar Creek to see what was going on. When Sheridan got about a mile south of Winchester he stopped, got off his horse, and put his ear to the ground and listened, not saying anything to his staff. Then he got up, put his spurs into his horse, Rienzi, and started to ride more speedily toward Middletown. 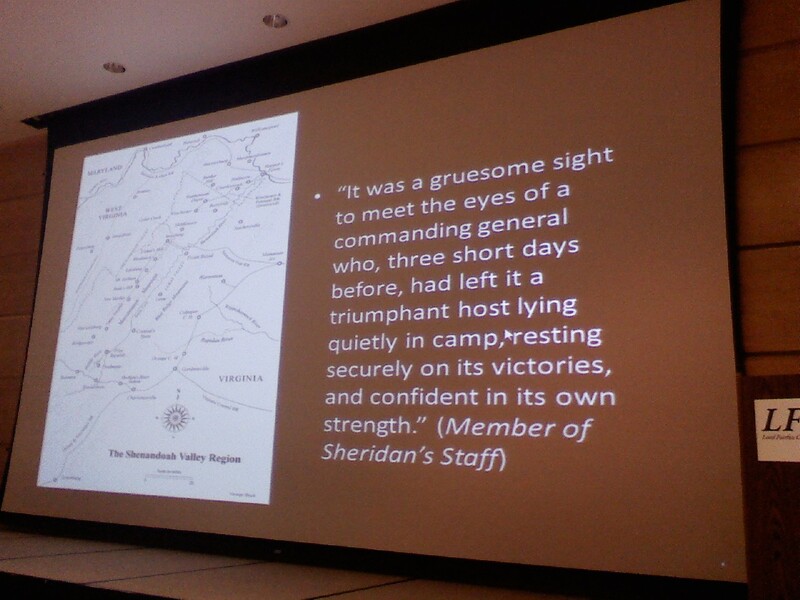 When Sheridan neared what is present-day Stephens City, he begins to see the first signs that disaster has befallen the Army of the Shenandoah. One of the first people to greet him was Major William McKinley, the future president, who helped Sheridan stem the retreat. Sheridan’s initial impulse was to pull his entire army back to Winchester and dare Jubal Early to attack him there, but then Sheridan thought that wasn’t the best thing to do. He felt it would show his men he lacked confidence in them. He felt a commander should show his men he believed in them. He wanted to show his men that he believed in them. 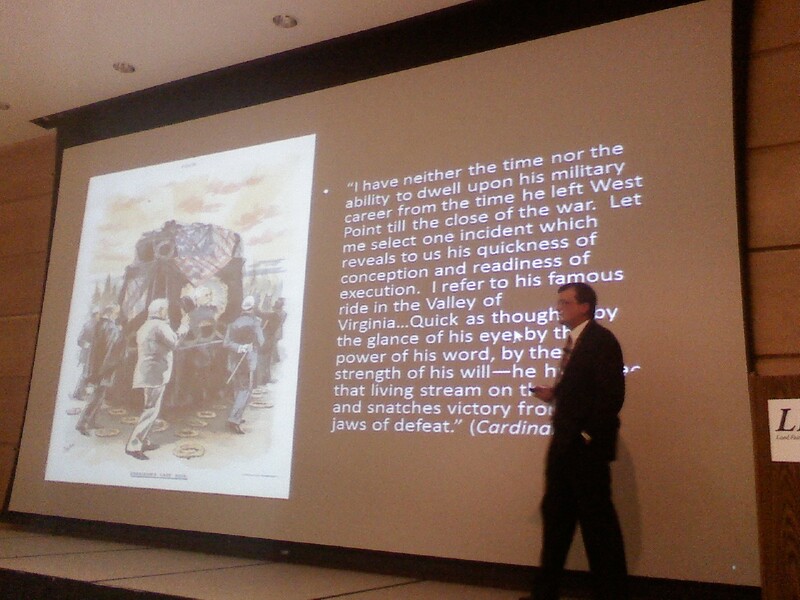 As he approached the army, he tried to inspire them, to instill confidence in them, and to energize them, and he did. One of the soldiers who was glad to see Sheridan as he arrived on the field about 10:00 or 10:30 that morning was General Horatio Wright. What Wright wrote was after August of 1888, after Sheridan’s memoirs were released. The day after the battle, though, Wright wrote a letter to his wife saying that Sheridan’s arrival “was a relief to me” and Sheridan “had naturally enough more influence over the entire army than I have.” Wright recognized that Sheridan had the ability to inspire the men that Wright lacked. Shortly after 4:00, Sheridan’s army launched its counterassault and pushed Early’s army out, pushing them south toward Fisher’s Hill. Cedar Creek effectively ended all military operations in the Shenandoah Valley. In the aftermath, soldiers praised Sheridan left and right. 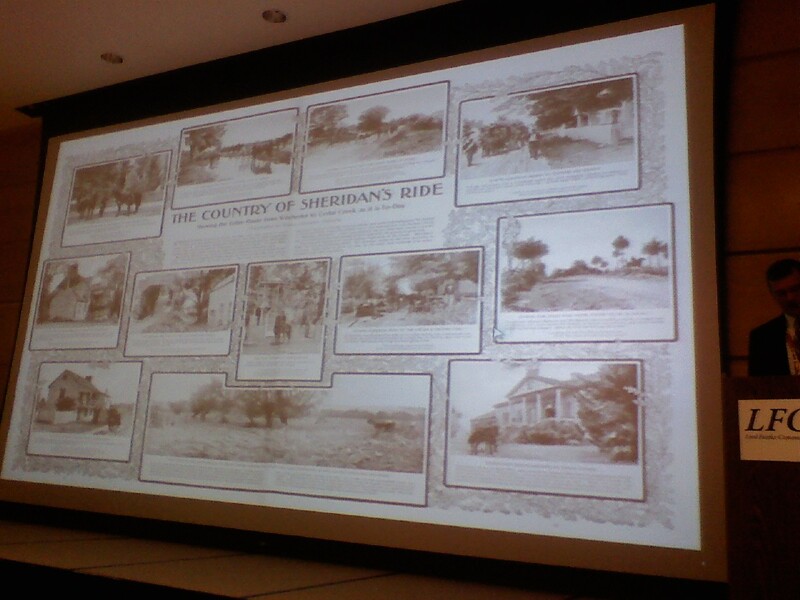 But as important as newspaper coverage was, as significant as this might have been, there was nothing that began to elevate that singular episode of Sheridan’s Ride more than the poem, “Sheridan’s Ride,” written by Thomas Buchanan Read. One author stated the motivation to write the poem was the Harper’s Weekly sketch. Jonathan said there was no way that could have happened. That sketch was released on November 5. The poem was recited for the first time on the night of October 31, 1864. So unless he was clairvoyant and knew what Sol Eytinge was going to do, there is no way that could have been the inspiration. The real true muse for the poem is an amalgamation of things. Read was obviously reading the newspaper accounts in the immediate days after the battle, but the real impetus was his friend, James Murdoch. James Murdoch was a well-known Shakespearean actor at the time. 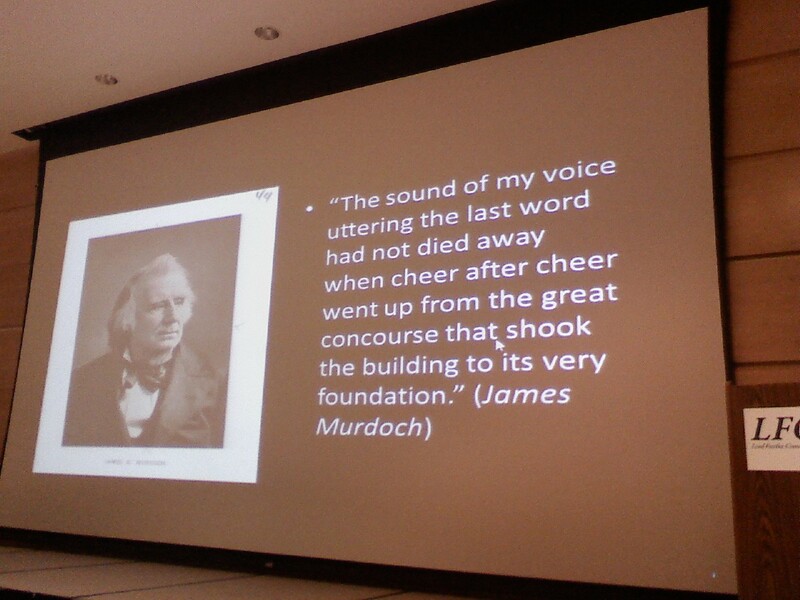 Murdoch wrote his friend, Read, saying, “On the night of October 31, I am being honored at Pike’s Opera House by the US Sanitary Commission.” He told Read, “I would like to perform something.” He suggested Read write a poem about Sheridan’s Ride. Read at first refused, but Murdoch, a close friend of Sheridan’s, kept pressing. He wanted to do something to further praise and lionize Sheridan. 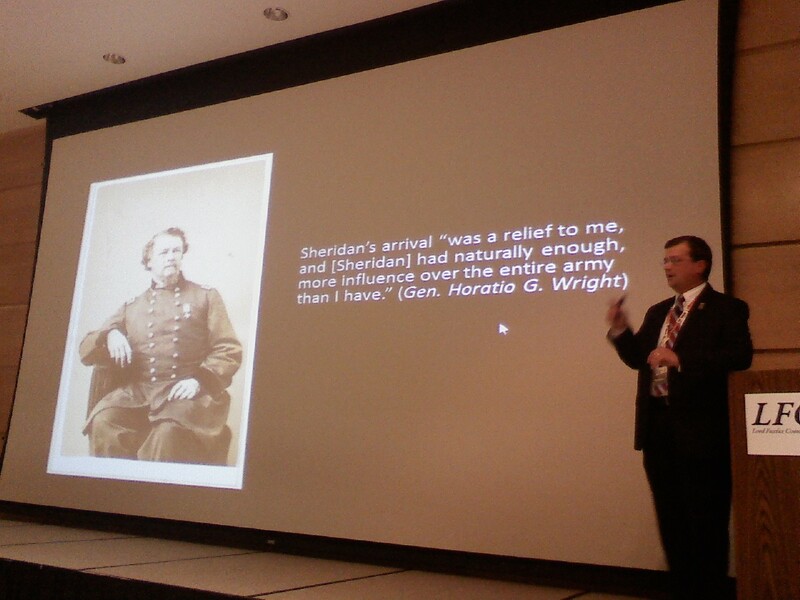 Sheridan once referred to Murdoch as a “great friend.” That friendship was cemented in November of 1863 when Murdoch journeyed to Tennessee to find the body of his son, killed in the fighting around Chattanooga. It was at that point that he got to know Phil Sheridan very well. Read produced the poem in a matter of hours and Murdoch was able to recite it for the first time at Pike’s Opera House. The audience went wild at the poem. The poem was published widely in newspapers across the North. It became not only something to celebrate the victory, but also a very nice tool for the Republican Party to work for Abraham Lincoln’s reelection. On Election Day, the New York Tribune published the poem on its front page. Sheridan’s Ride also made a sensation out of Sheridan’s war horse, Rienzi, who was renamed Winchester after the battle. So popular had this mount become that in 1876, P. T. Barnum advertised a traveling exhibit carrying the bones of the famous warhorse, Winchester. It was a popular exhibit, but Winchester at the time was still alive. The horse didn’t die until two years later. Sheridan had the horse stuffed. It was mounted and placed at the Governor’s Island Military Museum in New York Harbor. It stayed there until 1922 when a fire ravaged the museum, and then it was sent to the Smithsonian in Washington, DC. 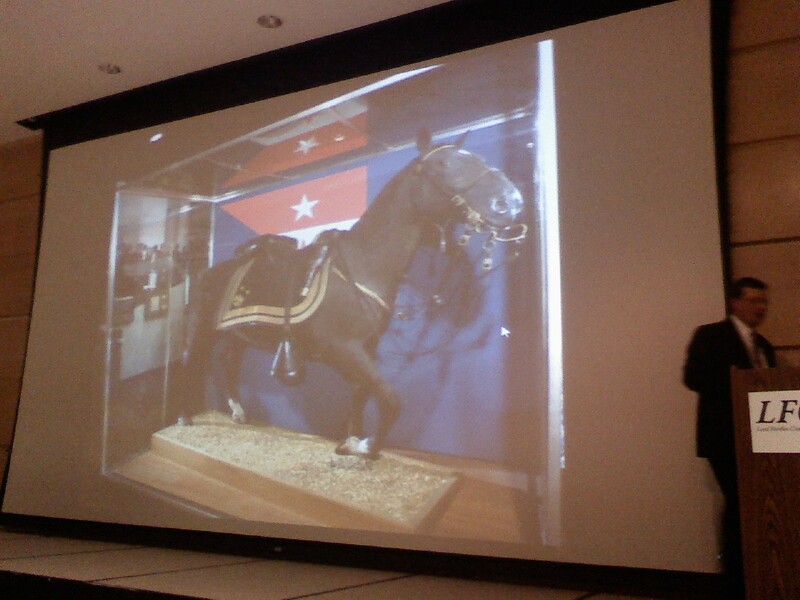 Due to the growing popularity of the event and the horse, it became a popular subject for artists after the war. There were three subjects that were extremely popular after the war that were attracting artists around the world. Number One was Gettysburg. Number Two was the clash between the ironclads CSS Virginia and USS Monitor. 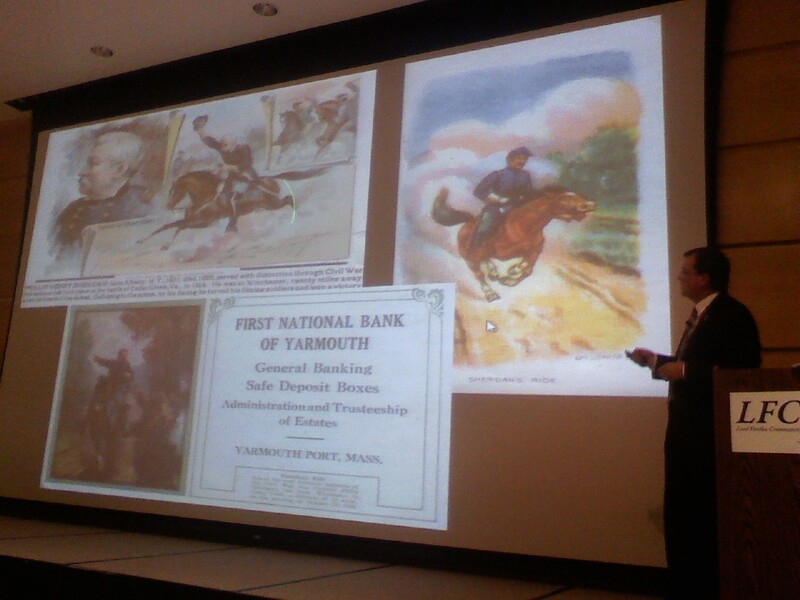 Number Three were depictions of Sheridan’s Ride. 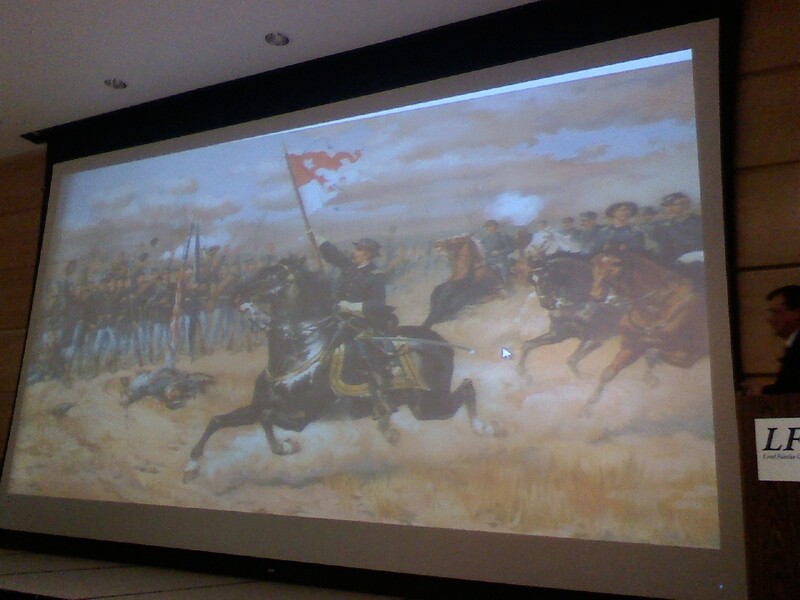 In the spring of 1865, the Union League of Philadelphia commissioned Thomas Buchanan Read to paint Sheridan’s Ride. 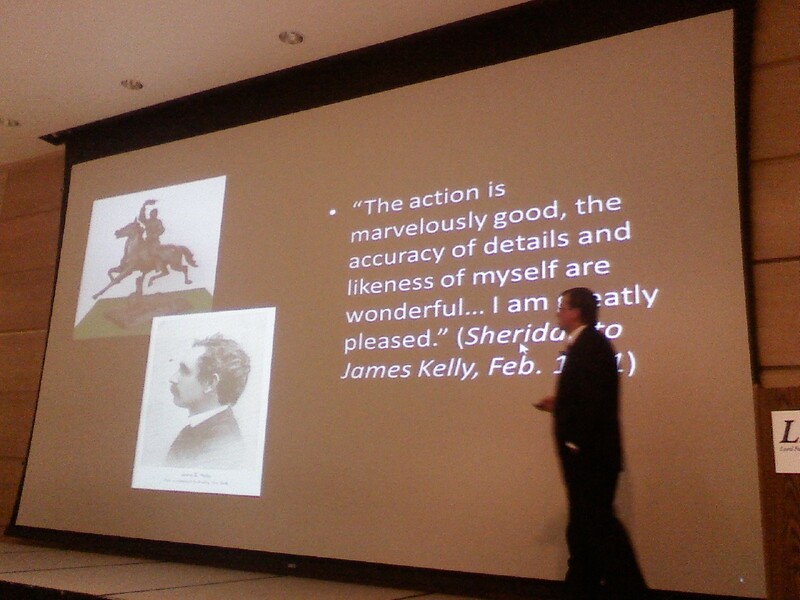 Read met with Sheridan, interviewed him, drew sketches of him, his equipment, and his horse, and after five years completed one of his greater works of art. It went on public display in March of 1870 at the Philadelphia Academy of Fine Arts. In the first month alone, 30,000 people paid money to see it. Many of those going to see it were men who fought with Sheridan. They [and Sheridan] were very pleased with this rendition. About a decade later, sculptor James Kelly met with Sheridan, studied him, interviewed him, made sketches of him and his equipment, and told him of his intent to produce a bronze sculpture of the event. Sheridan was really pleased when he saw the plaster studies. 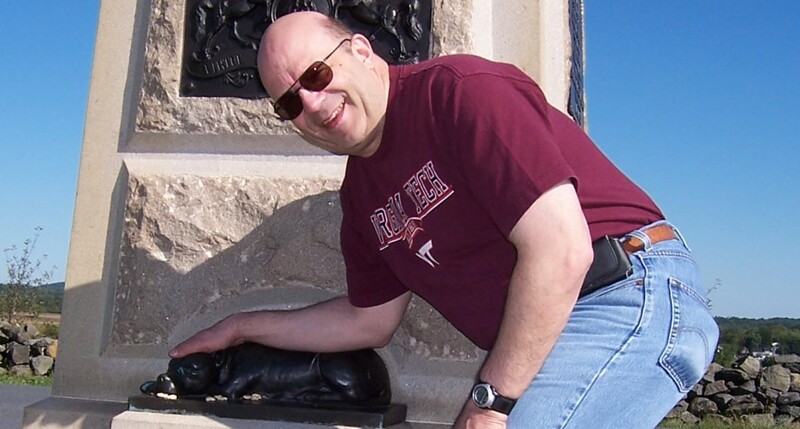 He was pleased so much he had the sculpture earmarked as the cover of his personal memoirs. But Sheridan’s approval of artistic depictions of his ride really ended there. One artistic depiction Sheridan didn’t like was this one, a chromolithograph done by the artist Thure de Thulstrup and published by the firm of Louis Prang and Company in 1886. When they published it, they thought they would be nice and gave Sheridan a complimentary framed copy of the print. When Sheridan got it, he was ticked. He was outraged and went on a profane rant. We know this because one of his staff officers leaked it to the press, and his reaction was published across the country, with many accounts using the exact profanity he used. This event became very popular in the decades after the war, well into the leading part of the 20th Century. You can pull an American history textbook from the North at any point from about 1865 to World War I and you can find good, detailed descriptions of the ride used as examples of patriotism and bravery. It was also used in advertising. 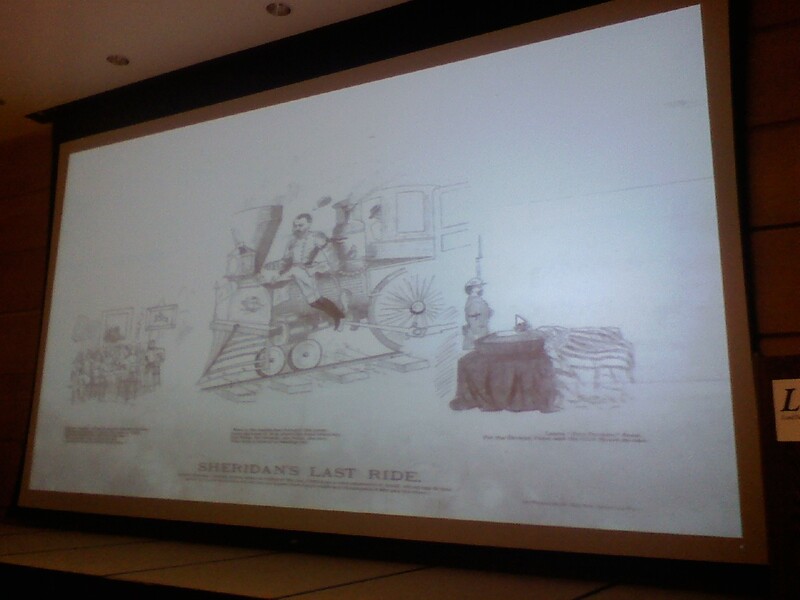 There are scores of images of Sheridan’s ride used to sell everything imaginable, including plows, insurance, and safe deposit boxes in banks. It inspired Frances Benjamin Johnston, a pioneering woman photographer in the late 19th and early 20th Century, to produce a two-page spread for the Ladies Home Journal that came out in 1901, entitle, “The Country of Sheridan’s Ride” that showed all the places in the Valley from the Logan House in Winchester to Belle Grove. Amidst the celebration came doubts in the years and decades after the war as to the real validity of the story. Much criticism of the Ride and its impact came from confederate veterans. 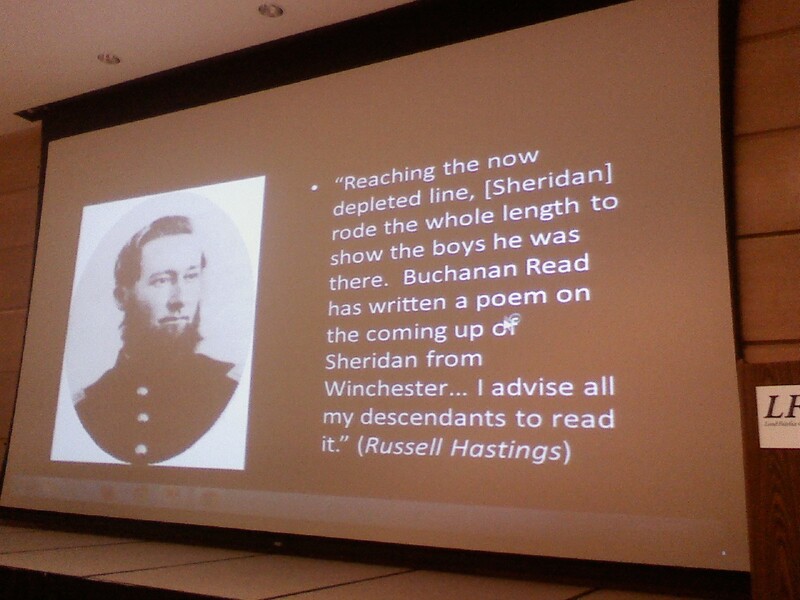 They focused on the opening stanza of Read’s poem that had Sheridan “twenty miles away.” The reality is Read was a poet, not a historian. To make the poem work, he has to use some poetic license. 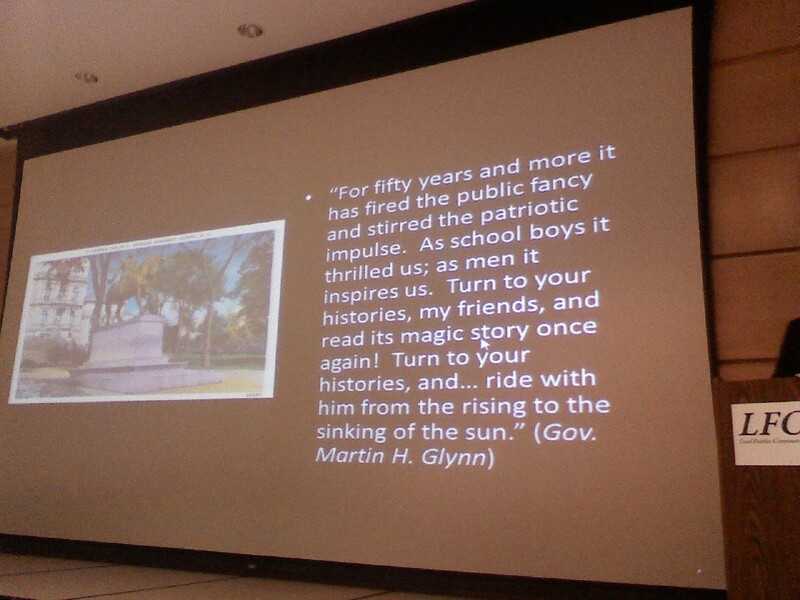 But Union veterans took affront to the criticism, and they would come to defense of Sheridan and the poem. One of these was Russell Hastings. In his writings he’s critical of Sheridan because he felt Sheridan never gave Crook’s command its due. 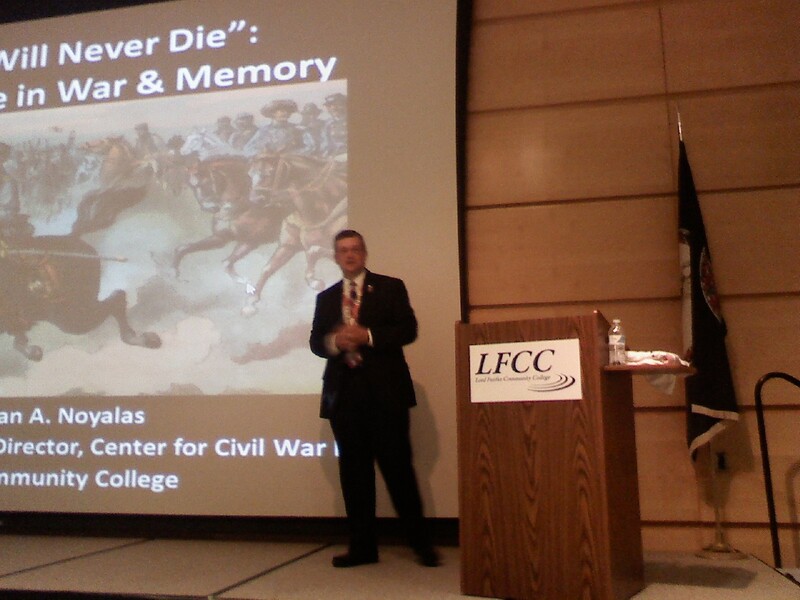 But he wasn’t going to sit by while confederate veterans were being critical. 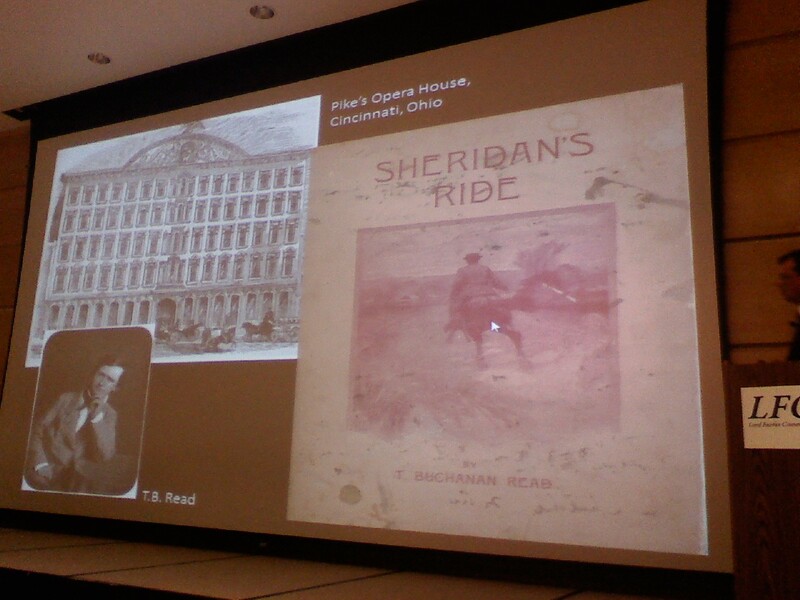 At the time of his death in 1888, Sheridan’s Ride was remembered in memorials and orations. The focus was always on The Ride. At his funeral mass, at St. Matthews in Washington, DC, the ride took center state in the eulogy by Cardinal Gibbons. At monument occasions of the Grand Army of the Republic reunions, his Ride took center stage for veterans of his campaign. 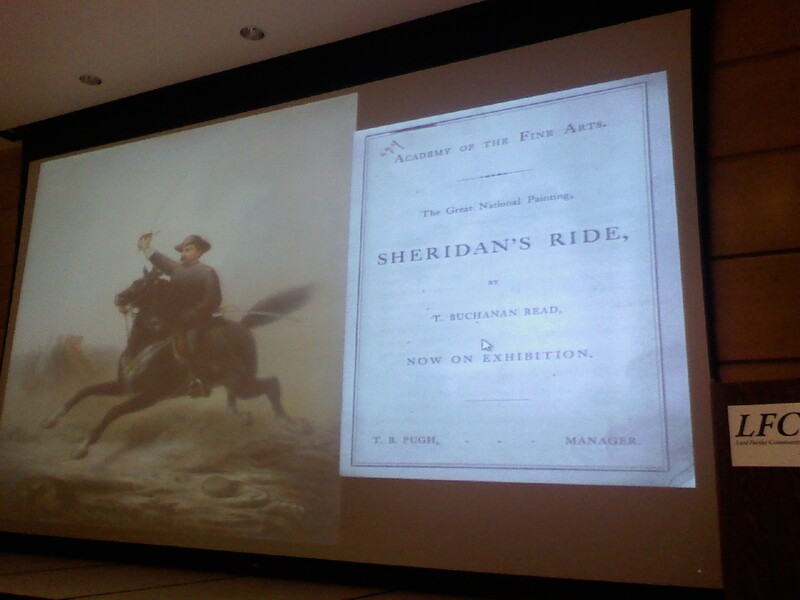 And whenever statues to Sheridan were dedicated, Sheridan’s Ride took center stage. Sheridan could never have fathomed how this one single event emerged as the defining aspect of his life. 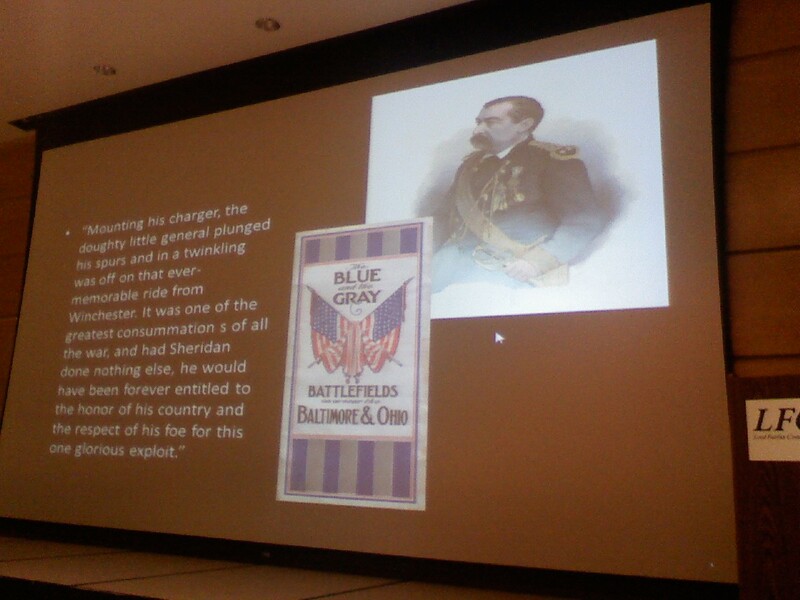 Perhaps it was the anonymous author of the pamphlet, The Blue and the Gray: Battlefields on or near the Baltimore & Ohio, published in the early part of the 20th Century, who really best captured what Sheridan’s Ride meant to his popular image. This was still another outstanding presentation, and we really enjoyed it a great deal.